The teams were closely matched and it was anyone’s guess who would win the day, and on that warm summer afternoon the starting whistle blew… The first thing that jumped out during the first half was how badly both team wanted this – hit after ferocious hit flowed from each team as they tried to gain supremacy in the first few jams. CCR started strongly but HWRD soon found their feet and it became very hard to tell which jammer would emerge from the pack first as the blockers swarmed their opposing jammers and held them back. Within the first quarter HWRD had taken a couple of power jams in their favour which gave them an early lead. Both teams formed extremely strong walls and had very agile, well-matched jammers which made the bout really exciting to watch. HWRD used slightly different techniques to CCR due to them predominantly preferring to eschew toe-stops in favour of a jam skate set up – and indeed some of the moves their jammers pulled made me think of jam skating through and through, which really added to the interest. As we approached half time, HWRD were slightly in the lead, although CCR were gaining. The lead was extended with a powerjam to HWRD which coincided with all but one of CCR’s blockers, being sent to the box for various infractions over a period of two laps, leaving CCR in a tighter spot than they would like! Once CCR were up to a full complement of blockers again they worked hard to rectify HWRD’s advantage and at half time the scores were standing at CCR – 62 and HWRD – 80. After half time, both teams kept pushing each other with no signs of their endurance wearing down and the score quickly changed to 103 to CCR and 115 to HWRD. There were a couple minor flurries of excitement, notably when HWRD’s jammer had to exit the track to retie a rogue shoelace, and a CCR toestop decided to exit the track without its owner’s permission, but both teams were unfazed. The big hits continued, and the physicality of the game didn’t let up for one second as strong CCR defence enabled the lead to switch in their favour: CCR were ahead by around twenty points with only a few minutes on the clock. Unfortunately, as anyone who watches much rollerderby knows, so often the final score is decided by powerjams and this was the case here. A late powerjam against CCR allowed HWRD to make up the difference in points and bring the score to a nail biting 167 all, before HWRD overtook CCR to take the lead and the final score was CCR – 170, HWRD – 176. It was a poignant ending for CCR as it was the last bout for one of their long standing skaters, Lethal Sizzle, before she moves to pastures new. CCR would like to thank Sizzle for all her awesomeness and hard work both on and off track as we wish her all the best in her future endeavours. CCR ROSTER: 42 Agent Dana Scurry (Captain), 85 Lethal Sizzle (Co-Captain), 10 Bunny Massacre, 19 Woo-Ha!, 119 Scarlette McCabre, 1212 Lola Whip, 333 Rubix Crude, 434 Dr InKnockulator, 57 Viv La France, 5000 Boots Manuva, 61 Erin Block’hervich 84 Tenacity, 800 Ghouldielocks, 99 Weston Super Clare. Bench Manager: Barry Fight. Line-Up Manager: Faze’Her. 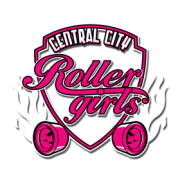 This was the last home game of the 2012/13 season for CCR, but you can still support your local Rollergirls at their upcoming fundraiser THIS Saturday:Central City Rollergirls invite you to join you to their third comedy night at the Old Royal on Church Street. (5 minutes from New Street, Free parking after 7.30pm outside) Tickets are £5 and need to be booked in advance here: http://centralcityrollergirls.moonfruit.com/#/comedy-page/4577136583 More details will be posted later this week!